Sea level rise puts coastal areas at the forefront of the impacts of climate change, but new research shows they face other climate-related threats as well. 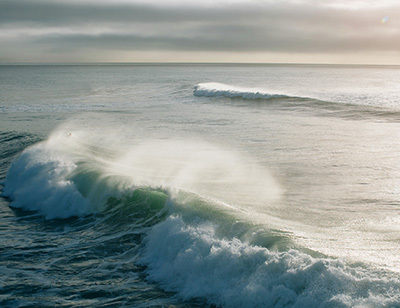 In a study published January 14 in Nature Communications, researchers report that the energy of ocean waves has been growing globally, and they found a direct association between ocean warming and the increase in wave energy. A wide range of long-term trends and projections carry the fingerprint of climate change, including rising sea levels, increasing global temperatures, and declining sea ice. Analyses of the global marine climate thus far have identified increases in wind speeds and wave heights in localized areas of the ocean in the high latitudes of both hemispheres. These increases have been larger for the most extreme values (e.g., winter waves) than for the mean conditions. However, a global signal of change and a correlation between the localized increases in wave heights and global warming had remained undetected. The new study focused on the energy contained in ocean waves, which is transmitted from the wind and transformed into wave motion. This metric, called wave power, has been increasing in direct association with historical warming of the ocean surface. The upper ocean warming, measured as a rising trend in sea-surface temperatures, has influenced wind patterns globally, and this, in turn, is making ocean waves stronger. “For the first time, we have identified a global signal of the effect of global warming in wave climate. In fact, wave power has increased globally by 0.4 percent per year since 1948, and this increase is correlated with the increasing sea-surface temperatures, both globally and by ocean regions,” said lead author Borja G. Reguero, a researcher in the Institute of Marine Sciences at the University of California, Santa Cruz. Climate change is modifying the oceans in different ways, including changes in ocean-atmosphere circulation and water warming, according to coauthor Inigo J. Losada, director of research at the Environmental Hydraulics Institute at the University of Cantabria (IHCantabria), where the study was developed. 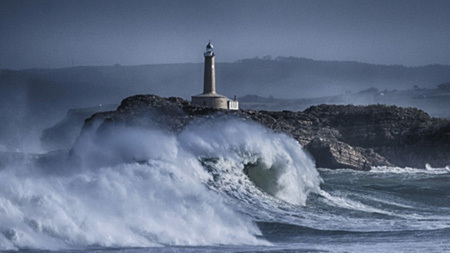 "This study shows that the global wave power can be a potentially valuable indicator of global warming, similarly to carbon dioxide concentration, the global sea level rise, or the global surface atmospheric temperature," Losada said. Understanding how the energy of ocean waves responds to oceanic warming has important implications for coastal communities, including anticipating impacts on infrastructure, coastal cities, and small island states. Ocean waves determine where people build infrastructure, such as ports and harbors, or require protection through coastal defenses such as breakwaters and levees. Indeed, wave action is one of the main drivers of coastal change and flooding, and as wave energy increases, its effects can become more profound. Sea level rise will further aggravate these effects by allowing more wave energy to reach shoreward. While the study reveals a long-term trend of increasing wave energy, the effects of this increase are particularly apparent during the most energetic storm seasons, as occurred during the winter of 2013-14 in the North Atlantic, which impacted the west coast of Europe, or the devastating 2017 hurricane season in the Caribbean, which offered a harsh reminder of the destructive power and economic impacts of coastal storms. The effects of climate change will be particularly noticeable at the coast, where humans and oceans meet, according to coauthor Fernando J. Méndez, associate professor at Universidad de Cantabria. “Our results indicate that risk analysis neglecting the changes in wave power and having sea level rise as the only driver may underestimate the consequences of climate change and result in insufficient or maladaptation,” he said. This research was supported by the Spanish Ministry of Science, Innovation and Universities (MCIUN).